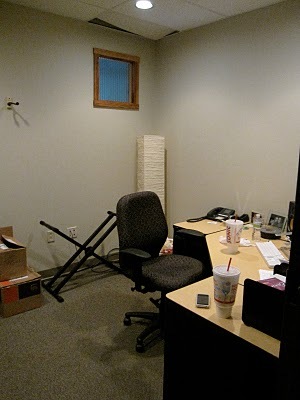 While in Nashville, I had the chance to help tweak my friend Erin's office. She works in a super creative environment here. She's one of those people that loves warm, lived in, interesting and TIDY spaces. I, too, am that kinda girl. So we picked up our Sonic Route 44 Diet Cherry Lime Cokes and quickly spun through my go to places: Home Goods, Michael's and World Market. *Now let me just say, her office would have looked great with a big dose of organization and tidying up. But we decided to take it a step further and warm it up a bit. 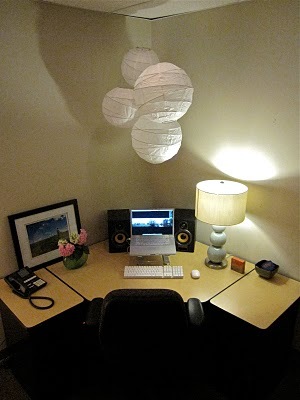 The lanterns are from World Market and the lamp from Home Goods (of course!). 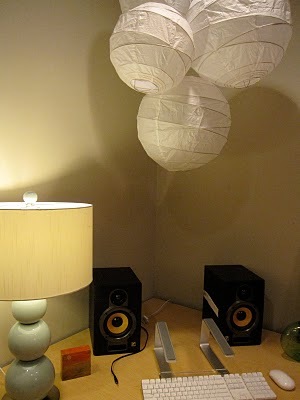 We tried the lamp on the other side of the desk as you can see by the above picture. It eventually found its home on the right side, but I thought you could see the detail of the lanterns & lamp in this picture. TMI. Sorry. 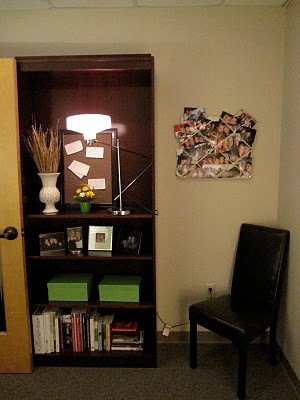 Don't really have before pictures of this side of her office because the above bookshelf was actually behind the door. Weird. So we moved it over to the right and rearranged and simplified. Much better. That little white vase is from Home Good's as well. Ok now this was really fun. Erin needed some art. So I channeled David Bromstad. He was the the first winner on HGTV's Design Star and was also one of the Design Mentors on that show I was part of. He's known for adding a "David Bromstad Painting" to each room he completes. One type of painting I've seen him do is the drip painting. I'm sure there's a fancier term, but that will work for now. I (with Erin's occasional help) painted a canvas by: 1) Moving random acrylic paint all over a canvas 2) Spraying canvas with water bottle 3) Watching the paint drip 4) Letting paint dry 5) And repeating. I think our finished product is kinda cool! Thanks for letting me play with your office! Just because I thought it was cute, I've included a picture of Erin and I at "I Dream of Weenie". It's a hot dog place in East Nashville that operates out of a vintage airstream. My hot dog had homemade pimento cheese on it. You must go there.